Emory University is an incredibly well-funded environment, especially when given recent NSF and NIH research funding statistics. 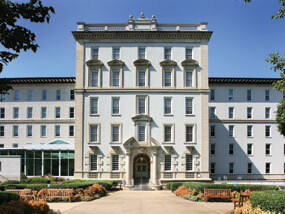 In total, Emory University received $274.2 million in research funding in 2012. The NSF awarded the university $10.6 million of research funding in 2012, and the money was spread out over a number of different departments at Emory University. Of the research funding, $2.1 million went towards bio research projects alone. Among the various life science programs of study awarded funding were neural systems, genetic mechanisms, systems and synthetic biology, physiology and structural systems, and cellular dynamics and function. In addition to receiving $10.6 million of NSF research funding, Emory University was also awarded $263.6 million in funding from the NIH. This money was also distributed among a number of different departments at Emory University, including anatomy/cell biology, biochemistry, biology, biomedical engineering, biostatistics, chemistry, family medicine, internal medicine, microbiology, pharmacology and veterinary science. For the convenience of our readers, we have compiled a list of the top five NIH-funded life science research projects in 2012, listed by project title and total funding awarded. According to information collected by Biotechnology Calendar, Inc., Emory University was ranked 22nd by the NSF in 2009 for total R&D expenditures in the life sciences, having spent a total of $417 million. In 2011, the NIH ranked Emory University 18th for direct plus indirect costs excluding R&D contracts and ARRA awards, making the total $273.4 million. Science researchers at Emory University were also awarded $539.7 million from external funding agencies in 2011, which represents an increase from the $535.1 million they received in 2010. Over the past five years, Emory University’s funding has increased by more than 52 percent. Given the statistics above, it’s clear that Emory University is a rich market for laboratory equipment sales. If you are a lab supplier or biotechnology vendor interested in meeting science researchers, lab managers and purchasing agents at Emory University, Biotechnology Calendar, Inc. invites you to attend our Atlanta BioResearch Product Faire™ Event on April 18, 2013. Biotechnology Calendar, Inc. is a full-service science research marketing and events-planning company that organizes trade shows at top research institutions across the country. Last year, our Atlanta BioResearch Product Faire™ Event attracted 213 attendees. Of those who visited, 58 were purchasing agents, professors and post docs, and 30 were lab managers. Those attending came from 34 different research buildings and 55 departments across campus. Don’t miss out on getting to know the Emory University market! For more information on Emory University funding statistics, click on the button below. If you are interested in getting to know another laboratory sales equipment market and attending a trade show closer to home, we encourage you to check out our 2013 calendar of events.